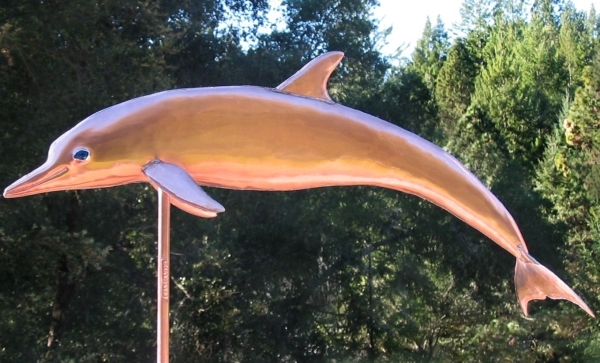 This Dolphin Weathervane, Delphinidae, was crafted entirely in copper. 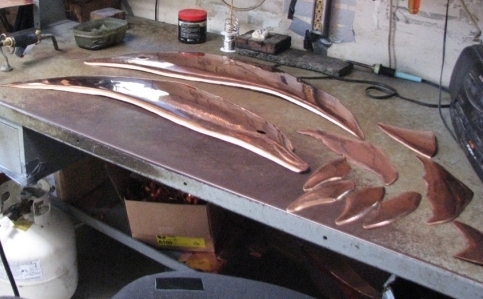 The dolphin’s eyes are made from translucent glass jewels. 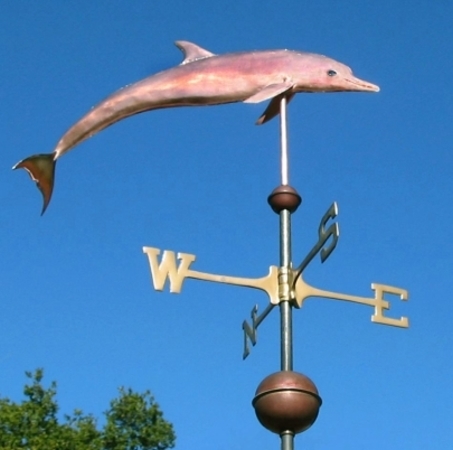 People who order this weather vane choose the eye color they want for their weather vane. 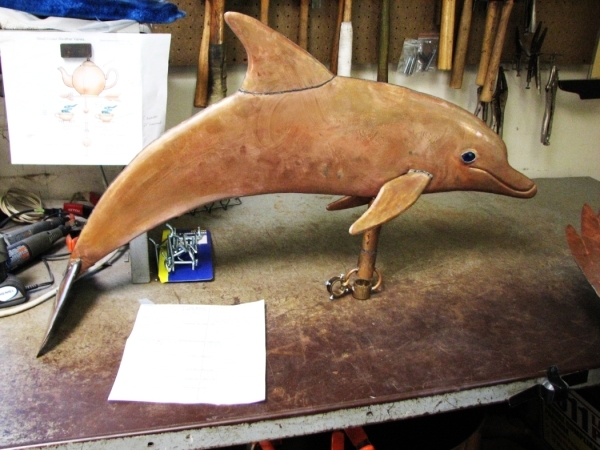 The dolphin is one of our earliest designs and one of our most popular. It has a very elegant profile against the skyline. Dolphins are known for their speed and agility which also makes it a popular mascot for a number of sports teams. 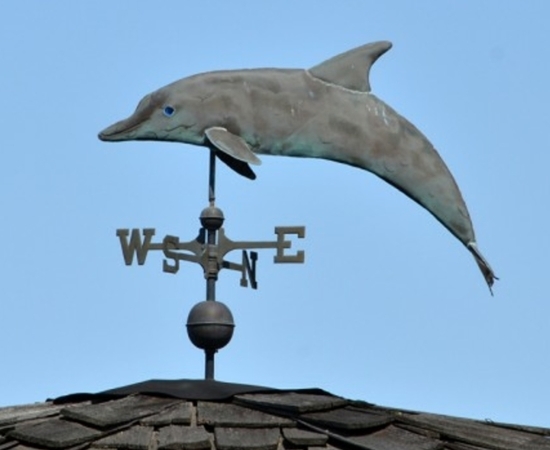 We offer other weather vanes that feature Dolphins. They include a Diving Dolphin and a Breaching Grey Whale with Dolphin. Dolphins are marine mammals closely related to whales and porpoises. There are almost forty species of dolphin. They vary in size from 1.2 m (4 ft) to 9.5 m (30 ft) and 10 tons for the orca or killer whale. They are found worldwide, mostly in the shallower seas of the continental shelves, and are carnivores, eating mostly fish and squid. 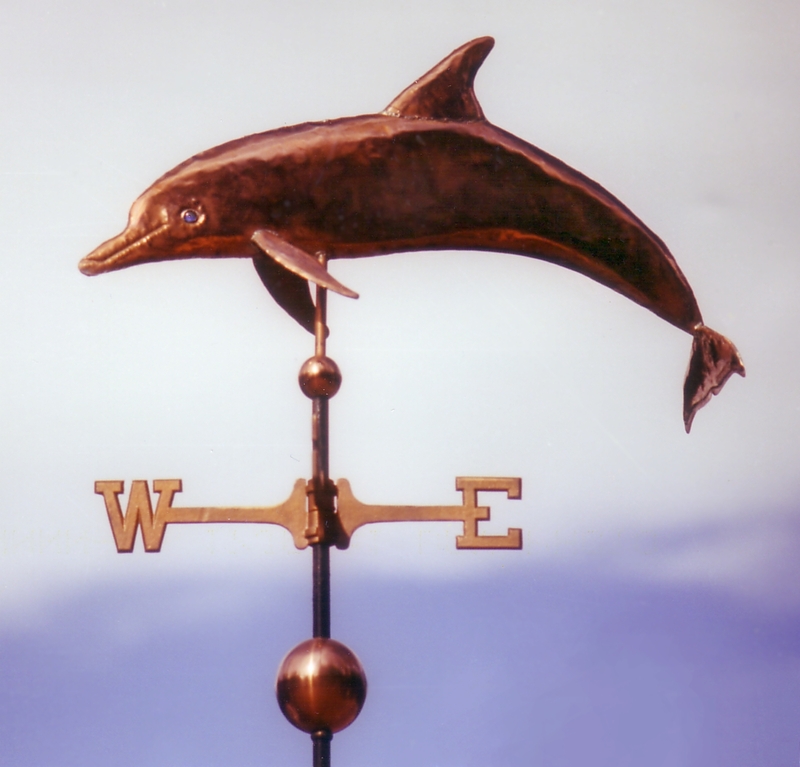 Dolphins appear in a number of Greek myths, invariably as helpers of humankind, especially sailors. Dolphins also seem to have been important to the Minoans, judging by artistic evidence from the ruined palace at Knossos. In Hindu mythology the Ganges River Dolphin is associated with Ganga, the deity of the Ganges river. The dolphin is said to be among the creatures which heralded the goddess’ descent from the heavens and her mount, the Makara, is sometimes depicted as a dolphin. The Boto dolphins in the Amazon River are believed to be shapeshifters, encantados, who are capable of having children with human women.